When you are selecting a location and design for your UNIQUE outdoor fireplace be sure that you consider the added benefit of winter dining by your fireplace. With the mild winter climate we enjoy in Arizona, outdoor dining is very enjoyable throughout the winter months. But as desert dwellers we do notice the chill when temps dip into the 50’s. However, a strategically placed fireplace can make those cook evening very pleasant. If the fireplace is being placed against your home then you have little opportunity to change the location. But if you are working in an open space, you have a few items to take into consideration. Obviously if you have a gorgeous view, you will not want to block it with a large fireplace structure. But if you are not working to preserve a view then consider other functions that your fireplace could serve. On blustery winter nights your fireplace could become a wonderful screen to block the prevailing wind. This can make dinner outdoors much more enjoyable even when the fireplace is not lit. Another benefit to consider is the western exposure for your dining area. In the summertime you will be very happy to dine in the shade and not the blaze of the setting sun. Also, once you have determined the height of your fireplace, be sure to stand at all of the windows which offer a view of the fireplace location. Make sure that your future fireplace will not be eliminating favored views or become an eyesore from inside your home. You can place a ladder in the desired location of the fireplace to give a visual height reference from inside your home. These ideas are just a few of the suggestions to consider before you select the final placement for your fireplace. With your fireplace location determined and your dining area planned, don’t forget to include some UNIQUE lounging space. After a nice meal you are certain to enjoy a comfortable outdoor sofa or some chairs to relax in as you enjoy the fire and possibly an after dinner drink or dessert. Furniture with removable cushions or pillows is always a good way to go. This allows you to reupholster as needed and also provides the perfect opportunity to add splashes of color to complement new accents and decor items. Anyone who is not familiar with an Arizona winter might think it a bit odd to be including an outdoor fireplace in your landscape design. After all, the area is famous for the “dry heat” which is a colloquial way of saying that we have low humidity as compared to other warm areas in the country. And that does mean that our extreme heat is more tolerable than the same temps accompanied by high humidity. However, what that also means is that in the wintertime there is very little moisture in the air to trap the daytime heat. So when the sun goes down so do the temperatures. And they drop quite rapidly. 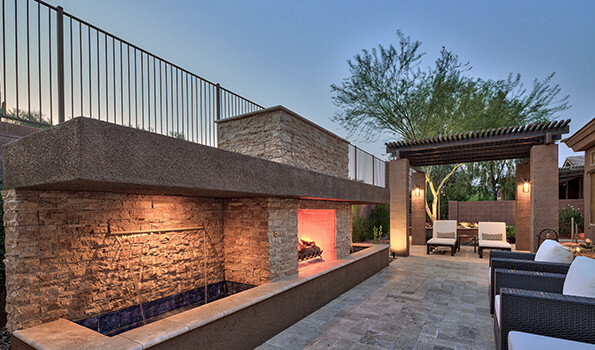 So you can count on getting a great deal use from your UNIQUE fireplace as you enjoy dining alfresco and relaxing in your outdoor living area on cool Phoenix winter evenings.